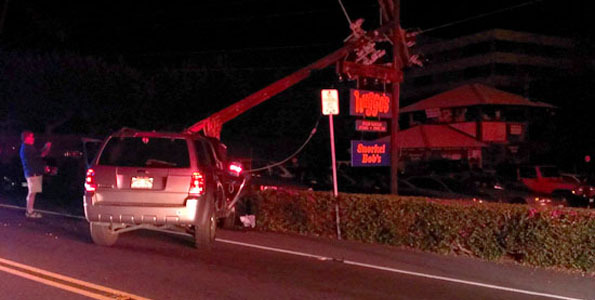 A one-vehicle crash Friday evening sheered off a utility pole and knocked out power along Alii Drive. An SUV collided head-on with the pole directly outside Huggo’s restaurant parking lot shortly after 8:30 p.m., plunging the waterfront and numerous bars and restaurants into darkness. Police closed Alii Drive and routed traffic through through Coconut Grove on the north side or up Walua Road on the south side. No injuries were apparent and police snapped handcuffs on one man. 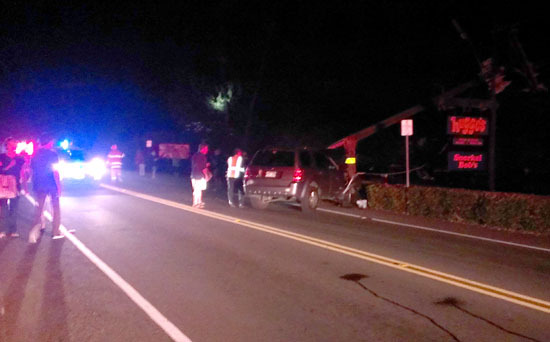 HELCO crews were on the scene by 10 p.m. and authorities expect the road to be closed until at least 2 a.m. Meanwhile, restaurants and bars closed up early, although Royal Kona Resort still had power. Royal Kona Resort does NOT have power – any idea when power will be restored?? ?